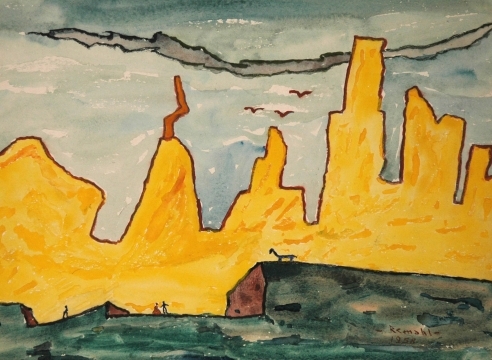 Remahl, a Swedish born (1901) artist often associated with the City of Chicago, the Chicago Society of Artists and his work with the WPA, continued to make art from the early 1920’s until his death in 1968 in Clairborne, Maryland. He is listed in the standard historical references of Who Was Who in American Art, the Annals of the Chicago Art Institute, the Corcoran Gallery of Art in Washington, D.C. the Pennsylvania Academy of Fine Arts, and many others. He participated in exhibitions for thirty years, the last in 1953. His work is held in a half dozen museums. He produced a body of work united by the signature elements of his unique style. He persisted with a vision that was stark, primitive, simple and isolated from the main stream of art. Though he often dealt with the icons of the dark side of dreams, skeptical mysticism and death, his work is infused with precision, power and vitality. Frederick Anderson, later known as Frederick Remahl, was born on the small island Snesholmen off Bohuslan, Sweden on June 18, 1901. He was the first-born and after Swedish custom was named after his father, Anders Frederickson, hence the artist birth name Frederick Anderson. The artist’s father was born in Branneby, a province of Bohusland, Sweden in 1876. The artist’s mother, Anna Oktavia Olsen, was born in Onsoy, Norway in 1879. Remahl had two brothers, Ole and Jacob and three sisters Nina, Martha and Anna. For a 1932 review he reminisced about his family’s island home, “I spent and extremely happy childhood there among the seaweeds, sea shells, and driftwood—endlessly sailing and rowing small boats. The late autumnal storms, in particular, were impressive and I still remember them with awe and wonder. Remahl had an early interest in painting, which was said to be inherited from his mother. However, he did not seriously pursue artistic endeavors until he immigrated to the States in 1914. The Frederickson family settled in a Swedish community on the shore of Lake Superior near Two Harbors, Minnesota. Remahl enjoyed life on the Lake Superior so much like island life of his youth. Eventually, his love of the water led him to pursue his seaman papers enabling him to work on commercial vessels in the Great Lakes. Working his way through school as an able-bodied seaman he went on to formally study art at the Minneapolis School of Fine Art from 1920-1922, primarily under the direction of Anthony Angarola (1893-1929) who “was a first generation Italian Immigrant and much of his work focused on his compassion for persons struggling to adopt a foreign culture.” In order to clear up some confusion the artist, while at the Institute, choose to change his last name to Remahl, a name which came from his mother’s side of the family. In 1923 Remahl and his artist friend Sigfus Sigfusson would travel to Paris to study art. Following their return to the United States the artists moved to Chicago for greater opportunities. For the next 43 years Remahl would make Chicago his primary home. With a few sojourns to Minneapolis, he went on to marry, paint, exhibit, participate in artists’ societies, teach and raise his family in the Windy City. A year after their marriage Maria gave birth to their first child, daughter Peggy. The following year the family opted for a slower life and moved back to the Minneapolis countryside where Remahl both worked as an artist and taught private art classes. It turned out that life was not any easier in Minneapolis. Their son Daniel was born in 1931. Daughter Peggy recalls being told that “times were so difficult that in order to bring home a few dollars her mother would make fudge which her father and his brother would sell on the street.” Finances continued to become more difficult for the young family. The affects of the Great Depression forced them to move back to Chicago where Remahl continued to work as an artist but he supplemented his endeavors with work as a house painter wherever he could. Remahl’s big break came in 1937 when he was offered his first WPA project. Reflecting on this period the artist’s son Daniel remembered, “the utter happiness in the house when word came of Dad being accepted to work in the Federal Art Project. I had no idea that there was a Depression and thought that everyone lived in cold-water flats. The Federal Program was a major player in our lives.” It was during this period that he would complete his most famous projects including a cycle of twelve murals for the Chicago Board of Trade, a series for Cook County Hospital, as well as various paintings and a mural for the Chicago Public Schools. While completing his WPA assignments he continued to paint. Remahl had to tame his primitive style into more representational scene paintings that would be acceptable to the public and Increase Robinson, the director of the regional WPA efforts. In 1947, after World War II, the artist and his wife started “Remahl’s Little Gallery and Frame Shop” at 3962 Clark Street in Chicago. Always good with his hands, the artist found himself designing and making frames for their Gallery and Frame shop. 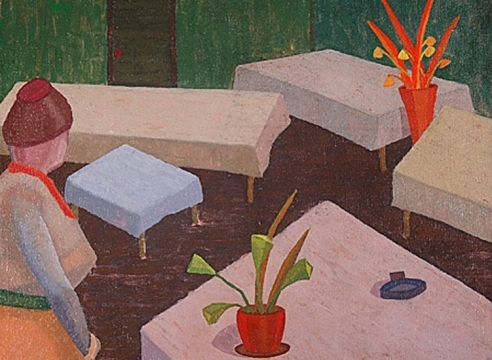 This retail space also gave him room to regularly exhibit his own paintings and those of his modernist contemporaries. But the constant pressures of life reflect in an increasingly less vital artistic output. Perhaps the artist also sensed that his paintings from Depression were his finest. Whenever he could find time, on weekends and vacations, he would return to his artistic efforts. But his later work seems rushed and unfinished. The careful planning and precise execution of his earlier days is gone. Eventually the Remahls were able to retire in 1965. They move to Claiborne, Maryland, not far from Chesapeake Bay, to be near their daughter Peggy. As if returning to his youth, Remahl purchased a small boat and sailed the South River and on to the great Bay. On January 12, 1968 the artist died as a result of pancreatic cancer at the age of sixty-seven. Color was everything for Remahl. His palette selections were limited and bright. He would have scoffed at the litany of colors available for artists today. In his oils he painted with primary and secondary colors and those mixtures that are defined as complementary. Orange, yellow, green, blue, red: over and over, the same palette in an unending variation of composition and subject. His watercolors have a much more expansive palette and were trials for the starkness that evolves in his in his more ascetic oil paintings. 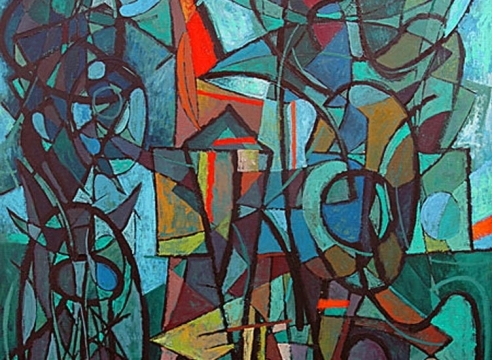 In addition to his reliance on color the unique nature of his work also depended on several other issues: his reductivism, flattened and simplified planes, primitivism, a unique set of visual metaphors and various techniques used to affect texture. In much of the artist’s work there is also a sense of that the painting might be taking place in a reverie or dream. In his most somber works there are references to isolation, the spiritual, and even to death. Part of Remahl’s artistic style is his ability to reduce the rounded shapes of landscape, facial feature and object into simple form. The artist’s work is full of flat trees, hills that might have been cut out of construction paper, and clouds that could have been ironed on. The influence for some of this comes from the artists of the Cubist movement. They were the first to abandon conventional perspective and reform it into an intellectual version of reality. In the Cubist world the palette is primarily darkened earth tones and it if often difficult to determine subject matter. In Remahl’s world colors are bright and subject matter clear. In his attempt to create simplified forms, the artist seems to be after the most basic element to represent nature – what artists sometimes call the truth of the thing. This gives way to a sense of the primitive in his work. He avoids the tradition of illusion employed in Realism and instead, for every element of a painting, he employs an intellectual authenticity devoted to finding the most reductive kernel of icon. One of the most obvious elements of the artist’s style is his personal library of iconography: : Dolls, Trolls, Fairies, Trees, Clouds, Smoke, Rocks, Hills, Nature, Seafaring Life. These are the principal icons in Remahl’s paintings, but the artist left little record of their meaning. Some of the inspiration for his compositions would come from his years in Sweden. The art of story telling was part of country life on the little island of Remahl’s youth. The artist would fondly recall his mother’s habit of telling and retelling provincial tales. In a short article in his scrapbook entitled “An Artist Speaks” Remahl states, “The literature of youth in Sweden is beautiful “Sagor” or fairy tales. These…make my childhood as a beautiful dream.” Scandinavian lore is full of magical dolls, mischievous trolls, bewitching fairies, and nature’s elements personified with special enchantments. The Swedish countryside, the land of the midnight sun, was alive with rich tales. But the most powerful of these Scandinavian storytellers was the great Hans Christian Andersen. Andersen's fame today rests on his fairy tales written between 1835 and 1872. "The Emperor's New Clothes", "The Princess and the Pea", "The Snow Queen", and "The Ugly Duckling" all share some element with Remahl’s fairyscapes. As a writer Andersen, perhaps because of his own childhood, strikes an alliance with the unfortunate and the those outcast from the core of society. Clearly Remahl, like Andersen, could be measured amongst those artists of the late 20th Century who proudly saw themselves as “outsiders”. Color was everything for Remahl. He was a superb colorist whose palette selections were limited and bright. He would have scoffed at the catalog of colors available for artists today. In his oils he painted with primary, complimentary and split complimentary colors. Orange, yellow, green, blue, red were applied in an unending variation of composition and subject. His watercolors, on the other hand, have a much more expansive palette and were trials for the starkness that evolved in his more ascetic oil paintings. 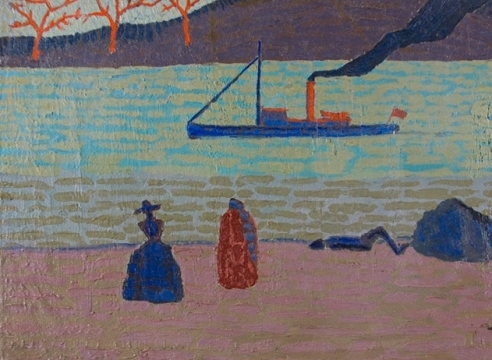 In addition to his reliance on color, the unique nature of his work also depended on other issues: reductivism, flattened and simplified planes, primitivism, a unique set of visual metaphors and various techniques used to affect texture. The mood in much of the artist’s work is clouded in dream. In his most somber works there are references to isolation, mysticism, and death. Part of Remahl’s artistic gift lay in his ability to reduce the rounded shapes of landscape, facial feature and object into simple, angled form. The artist’s work is full of flat trees, hills that might have been cut out of construction paper, and clouds that could have been ironed on. So many of the influences in Remahl’s work are descendant from the forces of the Armory Show of 1913: Cezanne’s flattening of planes, Gauguin’s focus on form, Modernism’s reliance on color, and the Cubists’ passion for reduction. It was the early Cubists who first abandoned conventional perspective. They reformed it into an intellectual version of reality, a practice common in Remahl’s work. The Cubists’ palette was primarily composed of dark earth tones and it is often difficult to determine subject matter in their work. In Remahl’s world, colors are bright and subject matter is clear. In his effort to create simplified form, Remahl was after the most basic element to represent nature – what artists sometimes call “the truth of the thing.” This gives way to a sense of the primitive in Remahl’s work whereby he avoided the tradition of illusion employed in Realism. 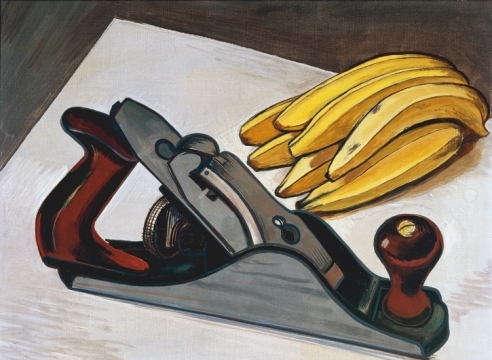 For every element of a painting, he sought the most base, clear and specific icon. In much of his work his reductive effort created a childlike simplicity also found in the primitivism of Gauguin’s Tahitian canvases and some of the work of the Fauves. One of the most curious elements of the artist’s style was his personal library of icons: Dolls, Trolls, Fairies, Trees, Clouds, Smoke, Rocks, Hills, Nature, and the Sea. Despite the importance of these symbols, Remahl left no record of their meaning. Some of the inspiration for his compositions would come from his early years in Sweden. The art of story telling was part of country life on the little island of Remahl’s youth. The artist would fondly recall his mother’s habit of telling and retelling provincial tales. In a short article in his scrapbook entitled “An Artist Speaks,” Remahl remembers, “The literature of youth in Sweden is beautiful ‘Sagor’ or fairy tales. These…make my childhood as a beautiful dream.” Scandinavian lore is full of magical dolls, mischievous trolls, bewitching fairies, and nature’s elements personified with enchantments. The Swedish countryside, the land of the midnight sun, was alive with rich fables. The most powerful of these Scandinavian storytellers was Hans Christian Andersen. Andersen's fame today rests on fairy tales written between 1835 and 1872. "The Emperor's New Clothes", "The Princess and the Pea", "The Snow Queen", and "The Ugly Duckling" all share an element with Remahl’s fairyscapes. As a writer Andersen, perhaps because of the poverty of his own childhood, stuck an alliance with the unfortunate and those outcast from the core of society. Like Anderson, Remahl could be counted among those artists of the late 20th Century who proudly saw themselves as “outsiders”. Remahl does not shy from the ultimate human curiosity – death. 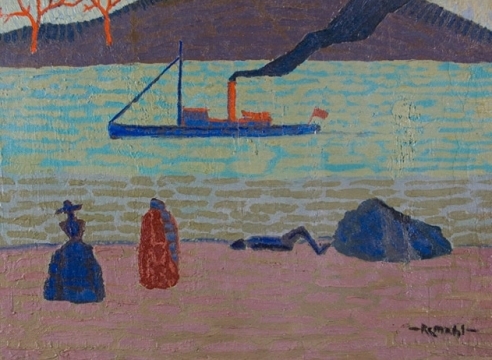 In the mid-ground of one of his paintings from the 1930's, “Figures on the Shore,” there is a blue and orange merchant vessel underway. In the foreground there are three figures; a woman in a bouffant dress, a dubious hooded and caped figure and to the right, what appears to be a body. Once again his icons created a sense of dream or nightmare in this painting with a complex iconography. He produced symbols for: one, the source of all life–woman; two, a close relationship to man and death in the hooded robe; and three, a frank depiction of death in the form of a supine body. He forces the viewer into the panorama of life that is juxtaposed with a bright merchant vessel and a startling background that includes three brilliant orange trees. In this tableau the artist calls the viewer’s attention to the primary elements of existence: life and death. 1. Davidson, Abraham A. Early American Modernist Painting; 1910-1935. New York; Da Capo Press, 1994. 2. Facos, Michelle. 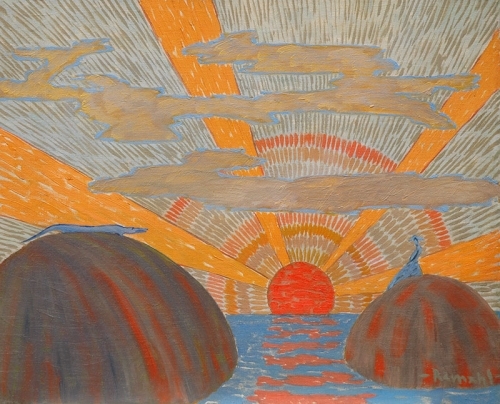 Nationalism and the Nordic Imagination; Swedish Art of the 1890’s. Berkeley, University of California Press; 1998. 3. Falk, Peter Hastings. The Annual Exhibition Record of the Art Institute of Chicago 1888-1950. Madison, CT; Sound View Press; 1990. 4. Falk, Peter. The Biennial Exhibition Record of the Corcoran Gallery of Art; 1907-1967. Madison, CT; Sound View Press, 1991. 5. Falk, Peter Hastings. The Annual Exhibition Record of the Pennsylvania Academy of Fine Art. Madison, CT; Sound View Press; 1989. 6. Falk, Peter Hastings. Record of the Carnegie Institute’s International Exhibitions. Madison, CT; Sound View Press, 1998. 7. Falk, Peter Hastings. 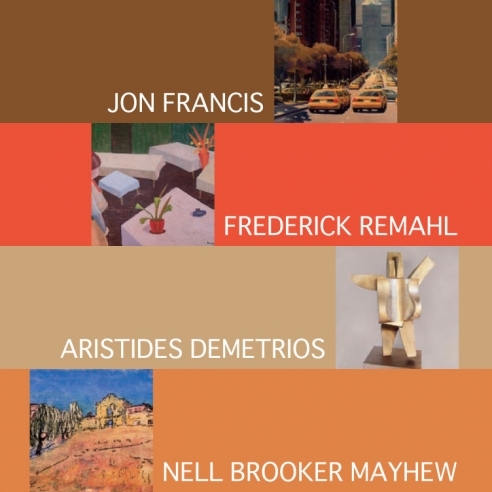 Who Was Who In American Art. Madison, CT; Sound View Press, 1985. 8. Jacobson, J.Z. Art of Today; Chicago – 1933. Chicago; L.M. Stein Press, 1932. 9. Kennedy, Elizabeth, et al. Chicago Modern: 1893-1945, Pursuit of the New. Chicago; Terra Foundation for the Arts, 2004. 10. Kenyon, Cox. “Artist and Public.” Scribner’s Magazine, 55 (April 1914). 11. Mallet, Daniel Trowbridge. Supplement to Mallet’s Index of Artists, International. New York; Peter Smith, 1948. 12. Remahl, Daniel. Son of Frederick Remahl, living in Frankfort, Michigan. Phone and written interviews and correspondence in August and September of 2005. 13. Remahl, Frederick. Personal Scrapbook – Newspaper and magazine clippints from 1925 – 1953. Archives of American Art. 14. Robinson, Peggy. Daughter of Frederick Remahl, living in Hayward, California. Personal, phone and written interviews and correspondence in August and September of 2005. 16. Yochim, Louise Dunn. Role and Impact: The Chicago Society of Artists. Chicago Society of Artists: 1979. 1935 Corcoran Gallery, Washington D.C.
1928 Corcoran Gallery, Washington D.C.